Technical conferences such as SPIE Photonics West are known for giving students the opportunity to present their research, perfect their presentation and networking skills, and actively engage with other researchers in a setting outside of their university lab. SPIE Fellow and University of Southern California Professor Andrea Armani, a strong advocate of student professional development, brings a group from her lab to SPIE Photonics West each year to present their latest work. You can follow along with the Armani Research Lab and their journey to the conference via Armani's Twitter feed. Hyungwoo Choi, Rene Zeto, Dongyu Chen, and Andre Kovach will accompany Professor Armani to Photonics West for a series of six presentations. The list of talks can be found here. Choi attended SPIE Photonics West last year as an author and was pleasantly surprised by the size of the audience that attended his talk, "My presentation was early in the morning on the last day of the conference. Also, I'm not a big name in optics and photonics -- I'm just a PhD student. So, I was expecting that not many people would show up to my presentation. However, more than 30 people attended, and at the end of the presentation I had many good questions from different researchers." This week, SPIE's Faces of Photonics interviewed Choi and Kovach to learn more about their work in the Armani Research Lab, their most memorable outreach experiences, and what gets them excited about the future of photonics. Enjoy the interview! 1. Share your favorite outreach or volunteer experience. 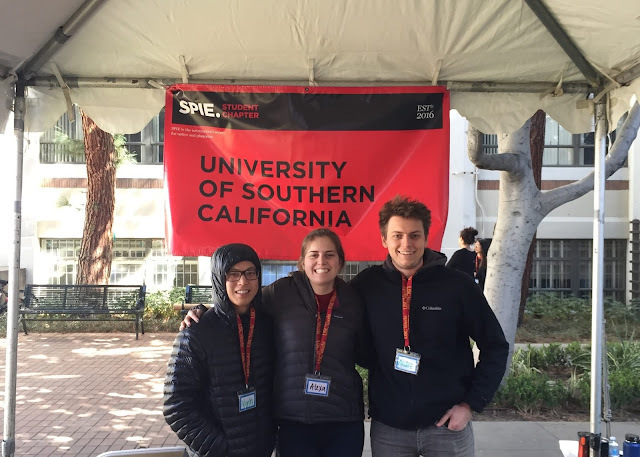 Kovach: My favorite outreach event was the SPIE booth that our USC SPIE Student Chapter had set up during EngX. EngX is a daylong engineering outreach event comprised of different activity stations. Hundreds of K-12 students stop by the stations and learn about different topics within science and engineering. Our booth was designed to demonstrate how lasers and optical cloaking work. Watching the students' faces light up after interacting with our demos was truly an amazing experience, and one that our chapter looks forward to every year. 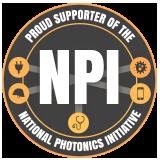 Choi: My favorite program was about introducing optics and photonics to students within South Central Los Angeles. I attended the event as a volunteer worker, and I was in charge of the virtual reality (VR) station. While I was explaining the science to the students, these parents with a baby came to our booth. The baby was only one- or two-years-old and couldn't speak a word. The parents checked out the VR demo first, and then showed it to the baby. As soon as he saw the VR image, he said, "Oooh!" very loudly and held the system tightly with his tiny hands. He spent several more minutes on the VR demo, saying "Oooh!" every once in a while. I will never forget that experience. 2. Explain your current research and how it impacts society. Choi: My research is focused on making lasers. I fabricate resonators, which can confine light for a long period of time. The buildup light is able to generate the amplified light by stimulated emission, which is a laser. 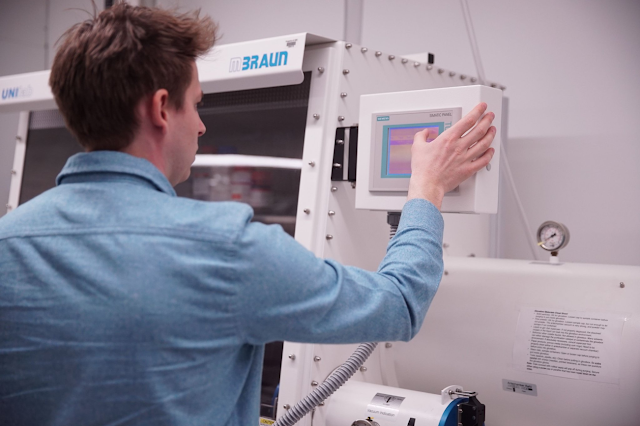 I apply some new synthesized chemical material to the existing lasers, and find novel properties out of the materials, such as a new emission wavelength or enhanced efficiency. The laser can be applied to various fields. For example, the scientists who received the Nobel Prize in Physics in 2018 developed new laser technologies, such as optical tweezers and high-power lasers for medical applications. This shows that the basic research I've done with lasers will pave the way to more applications in our daily lives. Kovach: Right now my research focus is on developing smart materials for integrated photonics platforms. I am working on light and magnetically-responsive materials for applications in optical switching and information storage. My hope is that someday my research can be used as components in future optical logic circuits for all photonic computing. 3. What are you excited to see in the future development of photonics? Kovach: I am most excited to see the development of sophisticated optical circuitry and its eventual replacement of electrical counterparts. More generally, I'm excited to see how photonics as a field will grow in the next few years given the current pace. Choi: LIDAR! If you follow technology news, you see there has been a lot of news related to autonomous vehicles, not only from the automobile industry, but also from many software companies such as Google, Apple, and Uber. They are investing huge amounts of money to develop fully autonomous vehicles. Most companies are carrying out research on increasing the sensitivity of LIDAR, while trying to decrease the cost. I'm really looking forward to seeing the development of the autonomous vehicle industry in the near future. 4. What is your advice for others in the STEM community? Choi: When you first hear about optics and photonics, it sounds like the one of the most difficult subjects to study -- at least that's what I thought. I had a conversation with Professor Armani about this, and she taught me what a resonator is and how it can confine light in a small device. After that explanation, I became interested! Once you start studying optics and photonics, you will realize that they are everywhere in our daily lives! So, don't be afraid of it. Try it, and I'm sure you will enjoy it.